But as the MIT team reports today in the Astrophysical Journal, the quasar's light is so bright that it has obscured hundreds of galaxies clustered around it. "This might be a short-lived phase that clusters go through, where the central black hole has a quick meal, gets bright, and then fades away again," says study author Michael McDonald, assistant professor of physics in MIT's Kavli Institute for Astrophysics and Space Research. "This could be a blip that we just happened to see. In a million years, this might look like a diffuse fuzzball." The paper's co-authors include lead author and MIT graduate student Taweewat Somboonpanyakul, Henry Lin of Princeton University, Brian Stalder of the Large Synoptic Survey Telescope, and Antony Stark of the Harvard-Smithsonian Center for Astrophysics. In 2012, McDonald and others discovered the Phoenix cluster, one of the most massive and luminous galaxy clusters in the universe. The mystery to McDonald was why this cluster, which was so intensely bright and in a region of the sky that is easily observable, hadn't been found before. "We started asking ourselves why we had not found it earlier, because it's very extreme in its properties and very bright," McDonald says. "It's because we had preconceived notions of what a cluster should look like. And this didn't conform to that, so we missed it." For the most part, he says astronomers have assumed that galaxy clusters look "fluffy," giving off a very diffuse signal in the X-ray band, unlike brighter, point-like sources, which have been interpreted as extremely active quasars or black holes. "The images are either all points, or fluffs, and the fluffs are these giant million-light-year balls of hot gas that we call clusters, and the points are black holes that are accreting gas and glowing as this gas spirals in," McDonald says. "This idea that you could have a rapidly accreting black hole at the center of a cluster — we didn't think that was something that happened in nature." "We start from archival data of point sources, or objects that were super bright in the sky," Somboonpanyakul explains. "We are looking for point sources inside fluffy things." For every point source that was previously identified, the researchers noted their coordinates and then studied them more directly using the Magellan Telescope, a powerful optical telescope that sits in the mountains of Chile. If they observed a higher-than-expected number of galaxies surrounding the point source (a sign that the gas may stem from a cluster of galaxies), the researchers looked at the source again, using NASA's space-based Chandra X-Ray Observatory, to identify an extended, diffuse source around the main point source. "Some 90 percent of these sources turned out to not be clusters," McDonald says. "But the fun thing is, the small number of things we are finding are sort of rule-breakers." "The brightness of the black hole might be related to how much it's eating," McDonald says. "This is thousands of times brighter than a typical black hole at the center of a cluster, so it's very extreme in its feeding. We have no idea how long this has been going on or will continue to go on. Finding more of these things will help us understand, is this an important process, or just a weird thing that there's only one of in the universe." "If the CHiPS survey can find enough of these, we will be able to pinpoint the specific rate of accretion onto the black hole where it switches from generating primarily radiation to generating mechanical energy, the two primary forms of energy output from black holes," says Brian McNamara, professor of physics and astronomy at the University of Waterloo, who was not involved in the research. "This particular object is interesting because it bucks the trend. Either the central supermassive black hole's mass is much lower than expected, or the structure of the accretion flow is abnormal. The oddballs are the ones that teach us the most." 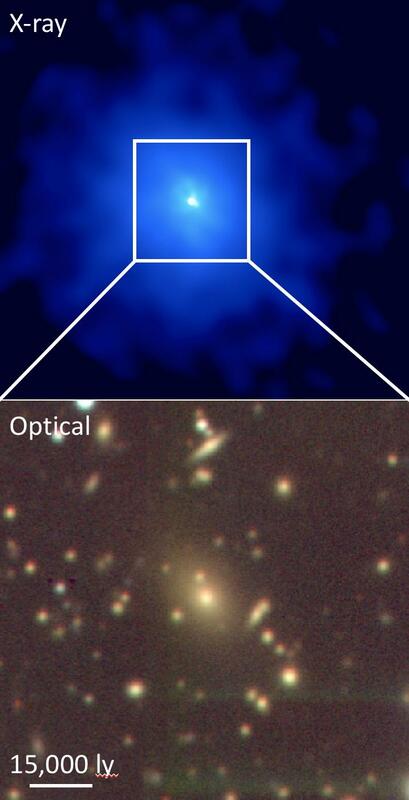 In addition to shedding light on a black hole's feeding, or accretion behavior, the detection of more galaxy clusters may help to estimate how fast the universe is expanding. "Take for instance, the Titanic," McDonald says. "If you know where the two biggest pieces landed, you could map them backward to see where the ship hit the iceberg. In the same way, if you know where all the galaxy clusters are in the universe, which are the biggest pieces in the universe, and how big they are, and you have some information about what the universe looked like in the beginning, which we know from the Big Bang, then you could map out how the universe expanded." <p>ARCHIVE: Why isn't the universe as bright as it should be?